Just because you suffer from seasonal allergies does not mean you cannot enjoy spring gardening and have a beautiful garden and yard. With some careful planning now, you can enjoy a spring and summer full of color without itchy, watery eyes and a runny or stuffy nose. 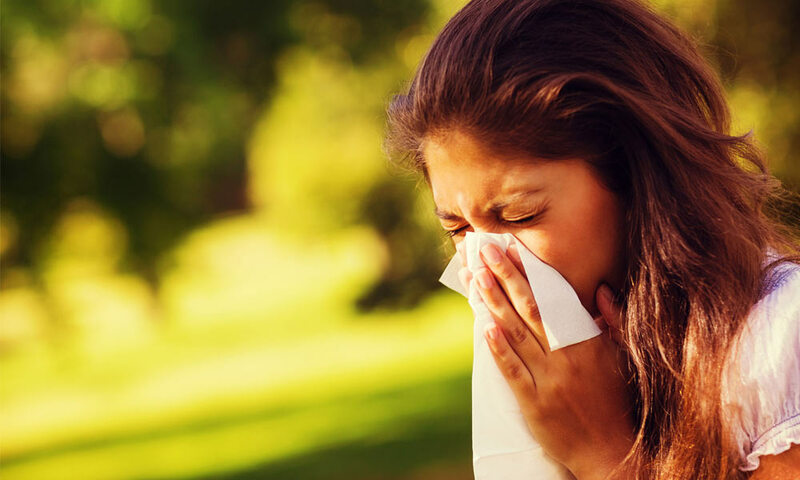 Seasonal allergies start in the spring with certain varieties of trees and continues on through the summer with grasses. The one thing that the allergy-causing plants have in common is that their pollen is spread through the air. If you keep this in mind, you can plan a spring and summer garden that is full of color but not air-borne pollen. One way to bring color to your yard without pollen is to select plants that have multi-colored leaves. There are many varieties of coleus that sport colors ranging from pinks, to yellows, to reds along with splashes of green and white. Scarlett, Pastel, Pineapple and Coral Sunrise coleus are beautiful mixed with common impatiens. Weigela will make a shrub with flowers that attract bees and hummingbirds. Because weigela relies on bees, butterflies, and hummingbirds to spread its pollen, it is perfect for the low pollen garden. In general, any plant that attracts bees or butterflies will not cause a problem with your allergies. This also means you can have hibiscus shrubs, buddleia, hydrangeas and roses in the yard and create an Eden for the pollinators without adding to your pollen problems. All of these plants rely on bees and butterflies to move pollen from one plant to another. All of your garden vegetables will be pollen allergy friendly. This includes the brassicas (cabbages, collards, broccoli, Brussels sprouts) the nightshades (tomatoes, peppers, eggplants, potatoes) and cucurbits (squashes, cucumbers, and melons). These plants all self-pollinate or utilize bees and other insects for pollination. This means that they do not produce air-borne pollen and makes them allergy friendly in the garden. If you want a plant that not only looks god but taste good, try Opal basil. The leaves are a beautiful purple and a delight to the eye. It is slightly fragrant so it pleases the nose. The leaves are yummy in salads and Italian dishes. The plant does not produce wind-blown pollen. You are safe planting any member of the mint family. This includes the mints, the basils, the oreganos and marjorams. When these plants do go to flower, they produce waxy pollen that attracts bees. They do not produce air-borne pollen. If you want to plant trees avoid elm and birch trees. Plant apple, pear, peach and dogwood trees for less air-borne pollen. If you want more succulent-type plants, use sedums such as golden sedum or dragon’s blood sedum. Hen and Chicks is a succulent with an interesting shape and color and will not produce pollen. If you have mold allergies, be sure to wear a mask when turning over the soil or moving mulch, as spores might be disturbed. With a little careful planning, have seasonal allergies does not mean you cannot have a colorful garden. Holiday Guests Allergic to Your Pets? Two people have reminded me that Christmas will be upon me before I know it. Thanks for the reminder! Exactly who took my 2018 and will they please bring it back? If you are expecting guests allergic to your pet, its time to take action! Holidays are a great time. Family and friends gather together for good conversation, good food, and good company. But if you have pets and your guests have allergies, wheezing, sneezing, and a grab for the rescue inhaler can put a damper on the fun. It doesn’t have to be like that! If you do a little advance planning and work, you can invite guests allergic to your pets to safely share the holidays with you and your pets. In this post, I am going to focus on the “day” guest. This is a person that will be coming into your home for a few hours, but not spending the night. I will cover overnight guests in another post to come. The time to start preparing is now! The first thing you must do is understand what is the cause of pet allergy. Then you will understand how to control it. Cats, dogs, and other furred animals secrete a protein in their saliva and urine that commonly misidentified by the immune system of a person with allergies. Every time the animals grooms itself or empties its bladder, bits of this protein stick to the skin and fur. It dries up and flakes off, either on its own accord or is shed with that bit of skin or fur. Once it is off the animal, it becomes airborne and is inhaled by the allergic person. The immune system of the allergic person has previously misidentified this protein upon a prior encounter with an animal. The immune system thinks the protein is a germ. It has created a specific IgE for that protein and upon every subsequent exposure it thinks it is fighting the same germ again and again. The mast cells start producing histamine and it just goes downhill for the allergic person from there. So, step one is complete! You now know why the animal makes the allergic person feel sick. The second step is to identify where the allergen has collected in your home and the final step is cleaning it up. Look around the rooms where your guests will be hanging out. Note upholstered furniture, rugs, carpets, and draperies. These fiber surfaces collect these shed bits of protein and when they are disturbed, they release the allergens back into the air. Start applying Allerpet solution for cats or dogs about 2 weeks before your guests come to visit. Just wipe the animal down with this mild denaturing agent. It will stop the animal from adding to the allergen level that already exists in your home. Do this at least once a week. About a week before the big visit day, start spraying all the fiber surfaces with a denaturing agent like ADMS Anti-allergen Spray. While primarily marketed for dust mite allergy, this product works great on allergens from cats, dogs, molds, pollen, cockroaches, and all the other common household allergens. The day before the guests arrive, vacuum all the fiber surfaces thoroughly and then spray them down one more time with ADMS. Special Note: You don’t want to vacuum just before your guests arrive. Most vacuum cleaners will just send the settled allergens up into the air, where they will be more easily inhaled by your guest. The morning of the big day, reapply Allerpet to the animal (as an added benefit this is a great-coat conditioner so you pet will look great for the guests!) and lightly spray down any areas where the pet sleeps. Now, go knock their socks off with your awesome culinary talents! Whether you order in or go all out cooking, your guests will be comfortable, your pet will be shiny and you will be thankful you read this post today! Allergy elimination is about eliminating the allergy-causing substance in your home the best you can. Once you do this, you may be able to eliminate the need for all the medications and doctor visits. For additional information please click here to download your free copy of” You Can Do It! Allergy Free Living. Fall is in full force now. It’s a great time to start thinking about changing out your summer bedding. Even if you don’t live in an area with significant changes in temperature, it is still a good time to freshen up your bedding, especially if you have dust or dust mite allergies. Your first line of defense is your zippered dust mite covers that you have on your pillows, mattress and boxs prings. If you didn’t take the cover off your mattress in the Spring and wash it, now is a great time to do that chore. A great snuggle season starts with bedding that is freshly laundered. Be sure to wash in either hot water or add some De-Mite if you are washing in cold. Wash with the zippers in the open position and be sure the cover is totally dry before you put it back on the bed. If you didn’t wash your mattress cover last Spring and haven’t done it recently, there is no time like this weekend to get that done! You are probably washing your dust mite pillow covers every 2 months or so. If you haven’t washed them in the last two months, throw them in the load with your mattress cover. Also, try to make it a habit to wash those pillow covers at least every 6 to 8 weeks. The oil from your hair and head can come through your pillowcase case and make the zippered cover look really dingy. It’s also time to start thinking about warmer blankets and quilts. If your Fall bedding includes a blanket or quilt that was not stored in a closed container, then before you put it on your bed, toss the item in your dryer and set to the fluff setting for 20 minutes. Do not use any heat! The tumble action of the dryer will help shake loose any dust that might have collected while it was in storage. If your quilt/comforter isn’t protected with a dust mite proof zippered duvet cover, then you should think about using one. The zippered cover will provide complete protection against any allergens embedded in the comforter and also help to keep the duvet/comforter itself clean. If you don’t use a zippered cover, then you can always spray your duvet, quilt or comforter or other bedding with ADMS Anti-Allergen Dust Mite Spray. Just give it a light mist on both sides and make sure it is dry before you put it back on the bed. If you change to jersey or flannel sheets in the fall months, make sure that your Spring/Summer sheets are washed in De-Mite or Allergen Wash before you store them. If you didn’t wash your sheets in either of these solutions, then make sure you do wash them before you put them on the bed. You want to start fresh. Now if you are going to take your summer quilt/blanket/comforter and get it ready for storage, make sure it is clean first. If it is washable, wash it and make sure it is completely dry. If it wool or silk that is not washable, take advantage of these last sunny days and expose your wool or silk to the sunshine. The ultraviolet light will freshen the silk and reactivate the lanolin in the wool. If you have large plastic storage bags or tubs, they are great for protecting your summer bedding until you need it again next year. If bugs are a problem, I recommend the use of cedar chips and cedar oil versus toxic mothballs to repel pests. If you have allergies and are thinking about adding a new quilt or comforter to your Fall bedding collection, then I recommend wool over down or synthetic fibers. The lanolin in wool naturally repels dust mites and also provides some antibacterial protection. I have used both wool and silk comforters on my bed. I prefer the wool over the silk, my hubby likes the silk better. The compromise is silk in the warmer months and wool in the cooler months (yes we do have what we think are “cool” nights here in South Florida during the winter). I know people really like down but it causes problems. Not only is it a dust mite heaven, but even if you cover your down quilt with a dust mite proof cover, the protection won’t last forever. Eventually, the quills on the down will penetrate the microweave and your cover will loose its effectiveness. Some people like to vacuum their mattresses a few times a year. It really isn’t necessary, but if it makes you feel more protected, then by all means, use this time of year as an excuse to do it.